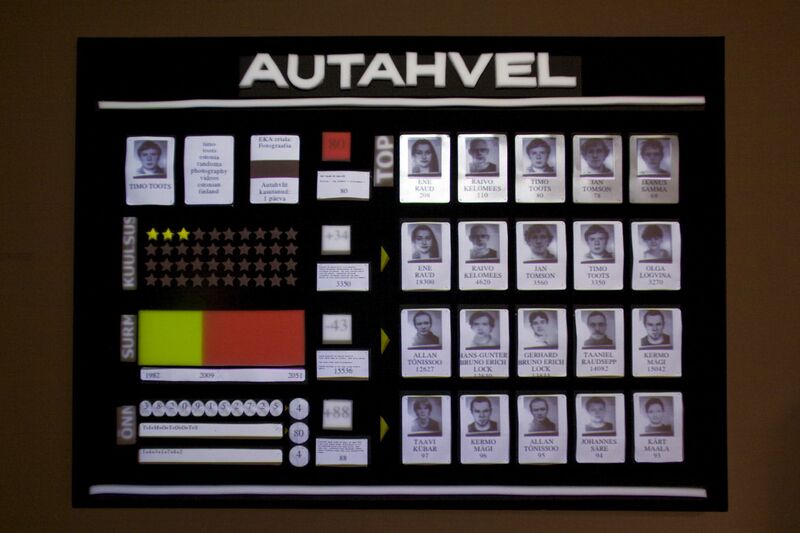 "Hall of fame" is an installation that calculates visitor's potential to be an artist. 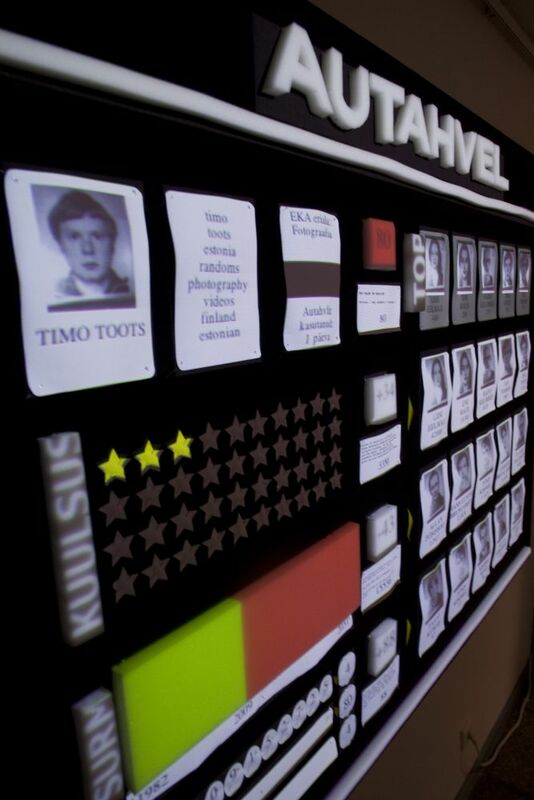 It uses national ID-card or passport as means of interaction and physical billboard with projected information. Private information and portrait from the document. This is the way visitor can put oneself on the Hall of Fame (if one is "artistic" enough to compete). 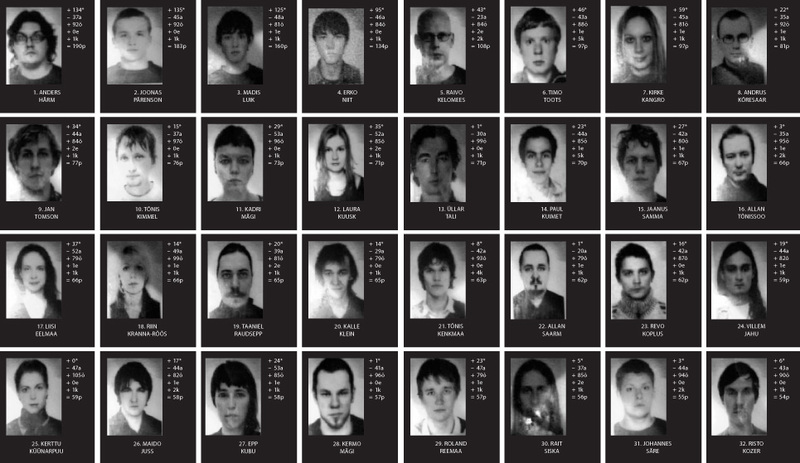 The billboard starts a sequence showing the statistics gathered and calculated about the person. The animated sequence is projected on paper or spatial objects on the billboard. This installation could be seen as fun social game, but it also deals with more serious issues. Data about everyone has become available to anyone. We need to be aware of the advancements in media technologies to accept them. Right now the acceptance comes without awareness. Estonia has been on the fast-forward mode in adapting new technologies as e-voting, e-government, e-everything. The way information is flowing together into one big relational database could be dangerous. Being born in Soviet Union I share the experience of converting from one Union to the Other. It makes me question. Are they really so much different from one another. One is red and other is blue, both share the yellow and the stars. So with these new ways of data fow spreading all over our lives I start wondering how the situation would be if we were still in the other side. How these privacy threats would be used, against or for us? The question arises, are they being used in the ethical way now here on this side of border? FAME. To be an artist, You have to be famous. The system queries a search of the person’s full name in Google search engine and fetches the number of results. The number represents his/her success in the social-media. DEATH. Dead artists is the best artist. The second statistics takes visitor’s date of birth and calculates one’s estimated time of death. This data is based on national statistics agency’s information. Visitors life is shown as a progress bar. It’s better to die sooner to become a better artist. LUCK. Luck plays important role for the artist. You have no control of a lot of things and this number represents it. The lucky number is calculated using visitor’s name converted info ASCII codes, average of document numbers and average of social security numbers. WORK. Every time you use the machine, you gain an extra point. A bit of work is needed. STUDY. 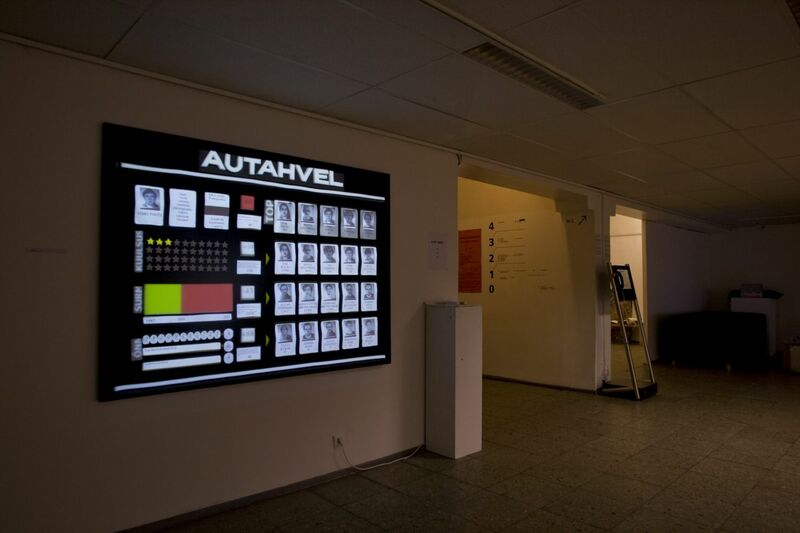 The first presentation of this type of site-specifc installation was in the Estonian Academy of Arts. It logged in the school's database and checked if you were a student. TEACH. The teachers in the school also got an extra point. Teach your methods and learn from the students!